Hayes’ Terin Kinsway (5) drives against Buckeye Valley’s Max Stokey (15) during the first half of Friday’s non-league showdown in Delaware. 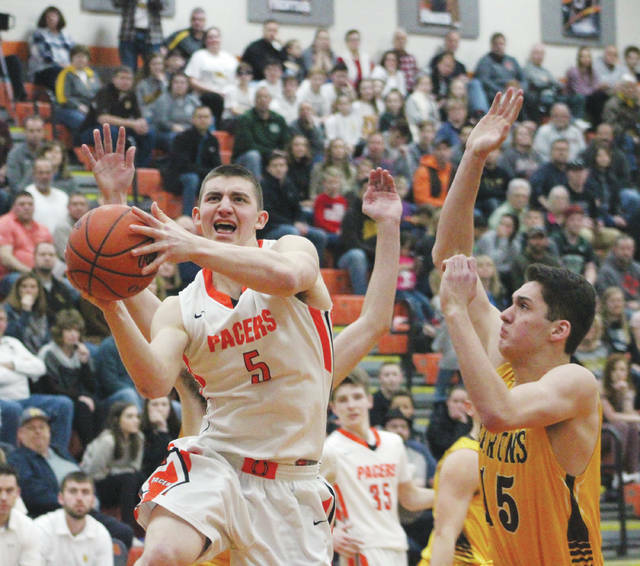 Terin Kinsway converted a three-point play with 1:36 left for host Delaware Hayes to finally put away rival Buckeye Valley in a 66-59 victory in boys basketball non-league action Friday night in Delaware. Buckeye Valley rallied back from a 12-point deficit in the second half to cut it to 57-56 with 2:04 remaining thanks to three-pointers on back-to-back possessions by Jack Rotondo and Elijah Jackson. Kinsway got a feed from Nate Griggs, drove the lane and was blocked on his initial attempt by BV’s Max Stokey. Kinsway ended up with the loose rebound and went back up and scored through contact, then added a free throw to push the lead back to four. Nate Griggs led the Pacers (9-12) with a game-high 28 points and Kinsway added 21. Griggs was particularly big in the third quarter with 13 points, including 8 of Delaware’s first 10 as the Pacers turned a three-point lead into nine. “He doesn’t look like a sophomore out there – he looks like a senior … especially with his poise down the stretch,” Kinsway said. Stokey and Jackson each knocked down treys for the Barons as part of a 9-2 rally to cut the deficit to 42-39 midway through the third. But, Hayes responded with a 9-0 run to push the lead as high 12 with 7:08 left in the game, highlighted by a Griggs three-pointer. Stone Foltz, Dylan Herbert, Rotondo and Jackson each buried threes in the fourth quarter to help the Barons get as close as one. Paul Frentsos’ three-pointer gave the Pacers an 8-5 lead with 4:41 left in the opening quarter and they never trailed again. Kinsway highlighted an 8-2 rally in the first half with a bucket and two free throws to give the Pacers some distance with an eight-point lead in the second quarter. But, Herbert scored 10 of his team-high 27 points in the second quarter to help keep BV close. Rotondo found Foltz in the left corner in the final seconds of the half to cut the Baron deficit to 30-28 at the break. Jackson finished with four three-pointers and scored 14 points for the Barons (7-15), who knocked down 12 as a team for the game. Delaware is right back at it today when it visits Marion Harding at 7:30 p.m. to close out its regular season. BV is off until it opens tournament play at Columbus South Feb. 26 at 7 p.m.
https://www.delgazette.com/wp-content/uploads/sites/40/2018/02/web1_terindrive.jpgHayes’ Terin Kinsway (5) drives against Buckeye Valley’s Max Stokey (15) during the first half of Friday’s non-league showdown in Delaware.